In my experience, when people are asked that question, they normally respond by making some kind of reference to the predicting of future events, as if the primary mission of a prophet is to tell us what will happen next week or next year either in our personal lives or out there in the world. But that's not true. That’s a false understanding of prophecy. Biblically speaking, prophets were people who spoke for God in the present moment and primarily about the present moment. At certain times they spoke messages of hope and comfort—at other times they spoke messages of rebuke and challenge, but always with respect to what was going on in “the NOW”! Yes it’s true—they did often refer to future events, but this was always with respect to what was happening in the present moment: "God says this bad thing will happen because of what you are doing (or what you are not doing) NOW! So you need to change your lives for the better NOW!" And so their message was almost always conditional. Everything depended on how people responded to the word of God that the prophet had spoken to them. If they responded positively, and changed their lives for the better, they would experience blessings; if they responded negatively, they would experience tragedy and disaster somewhere down the road. In today's first reading, from the Old Testament Book of Numbers, 72 elders (including Eldad and Medad) speak prophetically. But this upsets Joshua; he doesn’t think that Eldad and Medad should be prophesying, since they weren't with the other 70 when the Spirit descended on them. At that point Moses utters the famous line, "Would that all the people of the Lord were prophets! Would that the Lord might bestow his spirit on them all!" Moses thought that everyone had the potential to be a spokesperson for the Lord. And so, it wouldn’t surprise him in the least that prophetic activity has continued in the world from his time until our own. Nor should it surprise us. Do you believe what Moses believed? Do you believe that each and every one of us in this church right now has the potential to be a prophet for Almighty God in the modern world? You should! In fact, we don’t just have the potential to be prophets, we have the CALL to be prophets. And that call is rooted in our Baptism! The next time you're at a baptism ceremony, pay close attention to what the priest or deacon says to the child after he anoints him or her with sacred chrism. He says, "As Christ was anointed priest, prophet, and king, so may you live always as a member of his body, sharing everlasting life." One of the messages in that prayer is, "Child, may you be a prophet in your earthly life, teaching the gospel to others first by what you do, but also by what you say." At this point, I'd like to share a little bit about my vacation—which actually is NOT off topic, as I'll make clear in a few moments. As some of you know, I was away from September 14th until the 23rd. I went to see a priest friend of mine, Fr. Chris Mahar, who's studying for a special degree in moral theology at the University of Louvain in Belgium. And while I was there overseas, the two of us got to spend 4 days with a great woman who just happens to be a prophet for our time. Actually, she is a prophet for EVERY time and place--and for every era of human history. You see, aside from going to Paris and to various places in Belgium, Fr. Chris and I also spent 4 days in Lourdes, France, where our Blessed Mother appeared to a young girl named Bernadette Soubirous in 1858. Thousands of people from all over the world are there every single day of the year; it’s the largest pilgrimage site in the world. Many of those who go, unfortunately, are sick and dying. They go seeking a miracle cure for their illnesses—and some, happily, get their wish. Many physical healings have taken place in Lourdes since Bernadette first saw our Blessed Mother there. In the early 20th century, the Nobel Prize winning doctor, Alexis Carrell, witnessed two of them firsthand: one of an 18-month-old boy, the other of a 24-year-old woman. 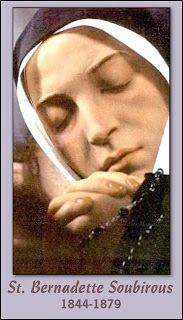 The cures that happen usually occur through the water that comes from the stream near the grotto where Our Lady appeared to Bernadette. I’ve been blessed to travel to Rome and the Holy Land and many other sacred places, but if you asked me what my favorite religious shrine in the world is, I would tell you without hesitation: “Lourdes”—and I know many others who would echo my sentiments. There’s something special about the place. There’s even a peaceful atmosphere in the religious goods stores and the restaurants and in other public areas of the town—and you don’t find that in most places, not even in Rome or the Holy Land. And how true that is! As I said, the sick and the dying are everywhere in Lourdes, and they’re experiencing incredible misery. But they do not appear to be miserable! It really is amazing. Those who go to Lourdes in that condition seem to be blessed with peace and an inner spiritual healing, even if they don’t experience a complete physical healing or any physical healing at all. What a contrast to places like our local casino! (This was another thought I had last week at the shrine.) In Lourdes you have lots of people in misery who are not miserable; at the casino you see lots and lots of people who are supposedly having a great time, but who look unbelievably miserable! At least that’s been my observation in the 10 or 12 times I’ve been there. Of course, what’s most important about Lourdes or any other apparition site is not the physical healings or even the peaceful atmosphere that you might find there—as nice as those things are. What’s most important about Lourdes and Fatima and Guadalupe and every other approved apparition site are the messages given to us in those places by Mary, our Blessed Mother; Mary who comes to us in these settings as a prophet! Her messages, incidentally, are always the same: she tells us to pray—to pray often; to pray from our hearts and not just with our lips; and of course she tells us to pray the Rosary among all our other daily prayers. She tells us to lead a sacramental life and to seek personal holiness. She always talks about faithfulness to Mass, and coming to Mass with the right attitude (which is not the “let’s-get-this-over-with-quickly-so-that-we-can-get-on-with-the-real-important-stuff” attitude that you find in many Catholics these days). She talks about getting to confession regularly, and confessing EVERYTHING that needs to be confessed! And she talks about engaging in acts of penance and charity, to make reparation for our own sins, for the sins of the world, and to draw down God’s grace into our own lives and into the lives of others. Like every true prophet, Mary speaks to us in the present moment about the present moment. And like a good prophet—as well as a good mother—she warns us about what will happen if we don’t take her messages to heart (which are the same messages contained in the gospel of her Son). Holy Mary, Mother of God, pray for us, that we will always take your prophetic and motherly messages seriously, realizing that you give them to us because you love us and because you want what’s best for us—here, and in eternity. Amen. From September 14-23, I was in Belgium and France visiting a priest friend, Fr. Chris Mahar, who is studying for a degree in moral theology at the University of Leuven, while also serving as Vice-Rector of the American College of the Immaculate Conception--a seminary which trains men for service as priests here in the United States. We visited the cities of Ghent, Brussels, Brugge, Leuven and Paris. We also spent a very blessed four days in Lourdes, France, where our Blessed Mother appeared to St. Bernadette Soubirous in 1858. A classic work of art: The Adoration of the Mystic Lamb by Jan and Hubert van Eyck in St. Bavo's Cathedral in Ghent. Chapel of St. Anthony in Leuven, where soon-to-be-canonized Blessed Damien of Molokai is buried. Fulton Sheen lived in the middle building when he was a graduate student in Leuven. The next 4 pictures are from the Basilica of the Precious Blood in Brugge. Fr. Chris says, "Au revoir." 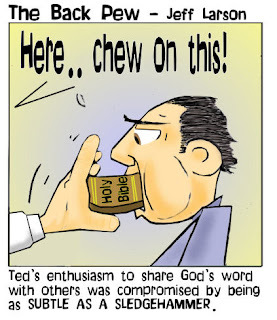 Not the best way to evangelize . . .
On Saturday, September 12, I gave two talks on evangelization at the annual day of recollection sponsored by the Christian Men's Breakfast Meeting Group. The Christian Men's Breakfast meeting began in 1978 when Father Joe Heaney and Tom Pucci, Esq, organized a group of men and began meeting in the basement of Saints Peter and Paul Cathedral in Downtown Providence. We have continued to meet every other Tuesday from 6:45 to 8:00 AM for prayer, lecture and small group discussion. We offer these Annual Days of Recollection to give family and friends an opportunity to share the Word of God, explore with one another the action of God in our lives and provide an opportunity to ask questions and clarify thoughts and doctrine about the Catholic Faith. Our motto is "Worship, Teaching, Service." 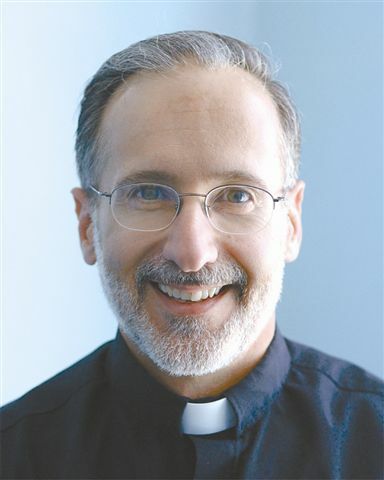 Father Frank Giudice is the group's spiritual director. Some people are physically incapable of hearing—like most of the people in those 3 little stories I just told, and like the man in today’s gospel whom Jesus healed near the Sea of Galilee. But others are deaf by an act of the will. That is to say, others are deaf by personal choice. This is something you encounter often as a priest—unfortunately. It happens when you meet a person who has heard you preach or teach on a certain topic, and has obviously tuned you out. For example, I’ve had some men and women who sit in these pews every Sunday tell me in no uncertain terms that they hate other people. Fr. Ray, it’s called “self-imposed deafness” or “selective spiritual hearing.” Take your choice. And speaking of “choice,” I have the same experience when I’m told about parishioners of this parish who proudly refer to themselves as “pro-choice”—or who actively support politicians who are of that persuasion. Ask yourself this morning: Is there anything that causes me to be deaf by choice? Is there any authoritative teaching in the Bible or in the Catechism that causes me to choose to be deaf? It could be something as simple as showing improper favoritism to others—the kind of thing that St. James speaks about in our second reading today. If a person is showing this kind of favoritism to someone else in order to manipulate them or to gain something financially, they will probably not want to hear about it from St. James or anyone else, and the temptation will be to turn a deaf ear to the one telling them the truth. 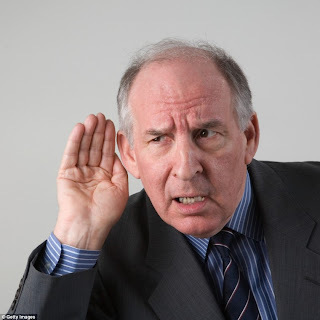 We can choose to be deaf on an issue like favoritism; but more often than not people today choose deafness with respect to one or more of the “hot button issues” of our time: abortion, artificial contraception, in vitro fertilization, sterilization, euthanasia, homosexual activity, etc. In fact, if the statistics are true about the number of Catholics who don’t accept the Church’s teaching on these and other key moral matters, then I’m sure there’s a lot of self-imposed deafness out there. And I think most good priests would agree with me, based on what they hear—or perhaps I should say what they DON’T hear!—in the confessional. That’s because the number of Catholics committing certain sins according to the polls don’t match up with the number of Catholics actually confessing those sins in the confessional. Some of the difference is probably rooted in ignorance: many Catholics, unfortunately, have been poorly catechized, and so they don’t know that certain actions are sinful. But that’s definitely not the whole story! Other Catholics have been taught properly—they have been properly catechized—however, they choose to disregard what they’ve heard. This, incidentally, is one reason why so many Catholic young people have gone astray. If our young people are going to be properly formed in the truth, we adults have to teach it—but first and foremost we have to believe it. If we’re not fully convinced of it ourselves—that is to say, if we have chosen to be deaf to certain aspects of the gospel—that will affect our ability to teach it to the next generation. Notice the connection in this gospel story between the man’s hearing and his ability to speak. The Bible says that when he first met Jesus this deaf man also had a speech impediment. In all likelihood, he had that impediment precisely because he was deaf! Usually those who can’t hear also have difficulty speaking properly—simply because they can’t hear themselves (or anyone else) talk. Well, believe it or not, the very same truth applies in the spiritual realm: Those who are spiritually deaf by choice, will also have difficulty speaking the gospel. They will have a hard time teaching the truth to others in a convincing manner. If we want him to, Jesus will cure us of whatever spiritual deafness we may currently be experiencing, as he cured this man of his physical deafness. But we have to freely choose, by grace, to allow him to exercise that power for us and in us. Just as we are deaf by personal choice, so also we are healed of our deafness by personal choice.